A great white pelican in breeding condition flying in Walvis Bay, Namibia. Length 1.3–1.8 m (4.3–5.9 ft), wingspan 2.44–2.9 m (8.0–9.5 ft), weight 5–9 kg (10–20 lb). Plumage almost entirely white, except for black primary and secondary remiges only visible in flight. Monotypic. Inland North America, wintering in Mexico. Status: Least Concern. Length up to 1.4 m (4.6 ft), wingspan 2–2.3 m (6.6–7.5 ft), weight 3.6–4.5 kg (7.9–9.9 lb). Smallest pelican; distinguished by brown plumage; feeds by plunge-diving. Five subspecies. Coastal distribution ranging from North America and the Caribbean to northern South America and the Galapagos. Status: Least Concern. Length up to 1.52 m (5.0 ft), wingspan 2.48 m (8.1 ft), average weight 7 kg (15 lb). Dark with a white stripe from the crown down the sides of the neck. Monotypic. Pacific Coast of South America from Ecuador and Peru south through to southern Chile. Status: Near Threatened. Length 1.40–1.75 m (4.6–5.7 ft), wingspan 2.45–2.95 m (8.0–9.7 ft), weight 10–11 kg (22–24 lb). Plumage white, with pink facial patch and legs. Monotypic. Patchy distribution from eastern Mediterranean east to Indochina and Malay Peninsula, and south to South Africa. Status: Least Concern. Length 1.60–1.90 m (5.2–6.2 ft), wingspan 2.5–3.4 m (8.2–11.2 ft), weight 4–8.2 kg (8.8–18.1 lb). Predominantly white with black along primaries and very large, pale pink bill. Monotypic. Australia and New Guinea; vagrant to New Zealand, Solomons, Bismarck Archipelago, Fiji and Wallacea. Status: Least Concern. Length 1.25–1.32 m (4.1–4.3 ft), wingspan 2.65–2.9 m (8.7–9.5 ft), weight 3.9–7 kg (8.6–15.4 lb). Grey and white plumage, occasionally pinkish on the back, with a yellow upper mandible and grey pouch. Monotypic. Africa, Seychelles and southwestern Arabia; extinct in Madagascar. Status: Least Concern. Length 1.60–1.80 m (5.2–5.9 ft), wingspan 2.70–3.20 m (8.9–10.5 ft), weight 10–12 kg (22–26 lb). 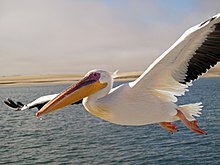 Largest pelican; differs from great white pelican in having curly nape feathers, grey legs and greyish-white plumage. Monotypic. South-eastern Europe to India and China. Status: Vulnerable. Length 1.27–1.52 m (4.2–5.0 ft), wingspan 2.5 m (8.2 ft), weight c. 5 kg (11 lb). Mainly grey-white all over, with a grey hindneck crest in breeding season, pinkish rump and spotted bill pouch. Monotypic. Southern Asia from southern Pakistan across India east to Indonesia; extinct in the Philippines and possibly eastern China. Status: Near Threatened. ↑ "Zoological Nomenclature Resource: Pelecaniformes (Version 2.003)". www.zoonomen.net. 14 December 2011. Retrieved 21 May 2012. ↑ Nellis, David W. (2001). Common Coastal Birds of Florida & the Caribbean. Sarasota, Florida: Pineapple Press. p. 11. ISBN 1-56164-191-X. Retrieved 29 June 2012. ↑ "Brown Pelican" (PDF). Endangered Species Program information sheet. US Fish & Wildlife Service. November 2009. Retrieved 9 June 2012. ↑ Chester, Sharon R. (2008). A Wildlife Guide to Chile: Continental Chile, Chilean Antarctica, Easter Island, Juan Fernández Archipelago. Princeton, New Jersey: Princeton University Press. pp. 174–75. ISBN 0691129762. Retrieved 29 June 2012. ↑ Austermühle, Stefan (17 October 2010). "Peruvian Pelican". Mundo Azul. Retrieved 9 June 2012. ↑ 13.0 13.1 Mullarney, Killian; Svensson, Lars; Zetterström, Dan; Grant, Peter (1999). Collins Bird Guide. Collins. p. 76. ISBN 0-00-219728-6. ↑ "Australian Pelican". Unique Australian Animals. Retrieved 10 June 2012. ↑ Langrand, Olivier (1990). Guide to the Birds of Madagascar. New Haven, Connecticut: Yale University Press. p. 96. ISBN 0300043104. Retrieved 29 June 2012. ↑ 22.0 22.1 22.2 Brazil, Mark (2009). Birds of East Asia. London, United Kingdom: A&C Black. p. 110. ISBN 0713670401. Retrieved 29 June 2012. ↑ "Brown Pelican breeding and nesting habits". Florida Wildlife Viewing. M. Timothy O’Keefe. Retrieved 5 August 2012.